This entry was posted on April 11, 2012 at 10:32 am and is filed under Barack Obama, Congress, fascism, first Jeremiah Wright term, Politics, Supreme Court. You can follow any responses to this entry through the RSS 2.0 feed. You can skip to the end and leave a response. Pinging is currently not allowed. This president really scares me! All of the people who used to say they would vote Obama in because 8 years of G.W. Bush couldn’t be any worse must either be too dumb to realize what they’ve done, or must be repenting as we speak. This president is trampling on our constitution and imposing his socialist regime on what was once such a beautiful democracy. We are, as the article read, dangerously close to a totalitarian regime. I’m really scared of another four years with him in office. Hi Michael, by the way! How have you been?? 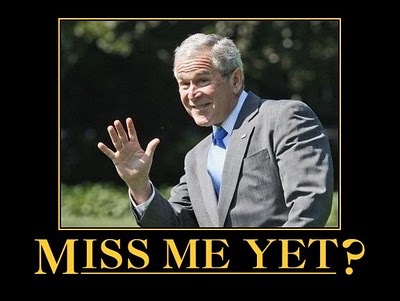 Say it with me, I want Bush back!!!! Just to prove that history repeats itself, the same people who voted for Obama are going to be voting for Antichrist soon so he can create literal hell on earth like Revelation says.